When installing Cumulative Update for Windows 10 Version 1607 (KB4015438), the update process appears to freeze or stop progressing, firstly at 10% while preparing for installing, and then appears to stall and stuck at “Getting Windows Ready. Don’t turn off your computer” message while Windows 10 is applying the update after system restart. Windows 10 may stuck at “Getting Windows Ready. Don’t turn off your computer” stage for many minutes or even hours with little or no hard disk activity (based on LED indicator). It’s even more frustrating that there is no progress shown and one cannot check for activity level in Task Manager. KB4015438 Cumulative Update is bringing the version of Windows 10 to OS Build 14393.969. KB4015438 intends to address a known issue introduced by KB4013429 that caused Windows DVD Player (and 3rd party apps that use Microsoft MPEG-2 handling libraries) to crash, and another known issue caused by KB4013429, that some customers using Windows Server 2016 and Windows 10 1607 Client with Switch Embedded Teaming (SET) enabled might experience a deadlock or when changing the physical adapter’s link speed property. This issue is most commonly seen as a DPC_WATCHDOG_VIOLATION or when verifier is enabled a VRF_STACKPTR_ERROR is seen in the Memory dump. The cause of KB4015438 appears to be stall or stop moving may simply because that KB4015438 is taking a long time to install properly. Based on user reports, the installation process may take anywhere from 10 minutes to more than an hour. If you forcefully power off the PC during the update process, the KB4015438 will fail to install, and you need to restart the updating process. The recommended solution is to simply wait out the KB4015438 installation process, which will ultimately complete and success despite the length of time it took. If you can’t wait that long, you can try to defer the update (in Settings -> Update & security -> Windows Update -> Advanced options) and hope that next cumulative update that supersedes KB4015438 will have none of the problems. 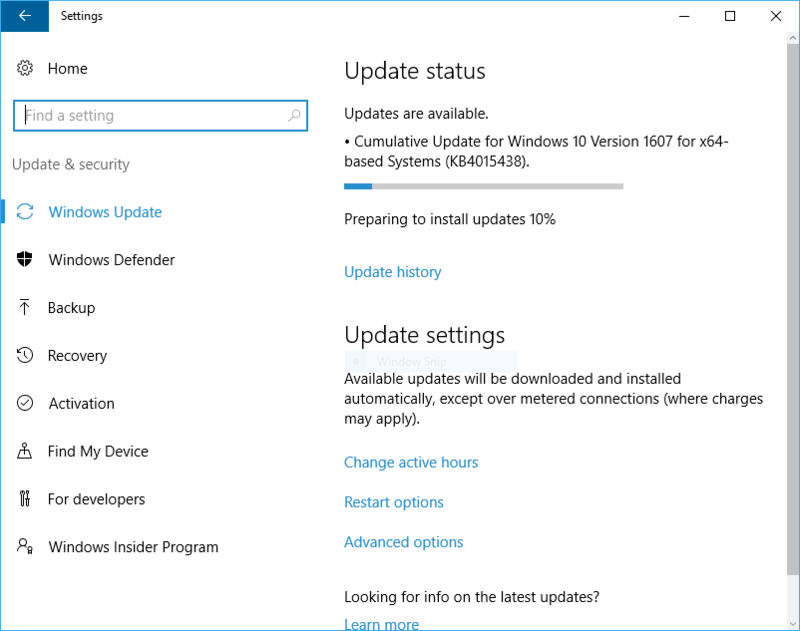 In fact, the next cumulative update that replaces KB4015438 which updates the OS Build to 14393.970, KB4016635, has available, but not yet available in Windows Update. You can try to download and install KB4016635 directly from Microsoft Update Catalog website.